Posted May 26th, 2014 by Hoffy Cycles. BMX vs mountian bike – which one should you get ? Deciding between a mountain bike and a BMX bike is one of the first choices that come to mind for people toying with the idea of buying new bikes. Both offer different riding experiences and both come with their pros and cons. For parents buying a bike as a present for their kids this is one of the questions we are often asked here at Hoffy Cycles. We outline the major characteristics of each in this post so you can make an informed choice and get the bike that is the best fit for them. BMX bikes are commonly considered the most robust bike – many owners find them virtually indestructible. Their compact frame makes them suitable for kids, but for adults especially taller adults more of the riding will be standing up to reach higher speeds. BMX Bikes are designed for a fun ride and thrashing around They are lightweight and easily transportable. Inexpensive. Quality BMX bikes enter the market at about half the price of a quality mountain bike. Less servicing and repairs of single speed bikes with no gears. Suited to urban environments including doing tricks and manoeuvres in skate parks and BMX tracks. Not suited to longer commutes or riding to work in Brisbane. Not designed for ‘in the saddle’ riding – making them not the most comfortable option. No suspension which makes the body absorb more impact compared to mountain bikes. 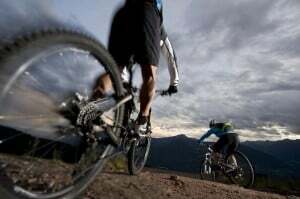 Mountain bikes are the most versatile riding option that comes normally with 21-24 different gears or speeds which makes them suitable for all terrains. Because of their different tyre sizes they are suitable for riders of all heights. Gears make for easier riding or different gradients. Much more versatile, can be ridden in all sorts of different settings including for commuting. Good handling on different surfaces and terrains and suspension makes for more comfortable riding. More expensive than BMX bikes to purchase. Don’t always have the ‘street cred’ and coolness that kids might be concerned with. Can be heavier and more challenging to transport without removing a wheel. More maintenance and repairs are likely when it comes to gears. Determining how often the bike is likely to be ridden is a major deciding factor in which will influence which bike you go with. Hoffy Cycles can ask you a number of questions to settle this topic of BMX vs mountain bike and help you make in informed decision. To see our exciting range of BMX, mountain bikes, road and commuter bikes and much, much more, call into our bike shop in Brisbane at 10 Bowser Pde Sandgate today!